Event planning, cause marketing, publicity, strategic introductions, hypelocal web marketing and online reputation management. After 13 years in the Atlanta market, the partners knew that their two Cobb County restaurants needed more than social web marketing to grow their customer base. They needed cause marketing and related services in order to enhance their image in the local community and drive customer loyalty because of their community service activities. During our time as their cause marketing and PR firm, we've conducted end-to-end marketing and publicity campaigns to drive recognition of the restaurant's good business citizenship and increase diner traffic to the franchise by executing the following strategies. Instituted a cause marketing campaign focusing on strategic alliances with several non-profit organizations: CURE Childhood Cancer, an elementary school in Kennesaw, GA and the USO. Provided food and assistance in serving quarterly lunches for 60 CURE families at the cancer wing of both Scottish Rite and Egleston Hospitals in Atlanta. Hosted Thanksgiving lunch (both food and serving assistance) at Scottish Rite Hospital and garnered coverage for CURE and Copeland’s on the local NBC affiliate station. Organized an Easter brunch benefit for CURE at both restaurants which raised nearly $1500.00 (20% of the day’s net revenue). Arranged donation of 250 restaurant gift certificates, as well as accommodations and Saints tickets for an auction item of a trip to New Orleans, for CURE’s Quiet Heroes luncheon in honor of mothers. Secured door prizes for parent-teacher meetings and catered (at a discount) a teacher appreciation lunch at the elementary school. Raised additional funds through customers throwing coins in the fountain in front of each restaurant. Created awareness of the relationship with CURE by collaborating with CURE’s marketing staff to secure coverage in print and broadcast media, as well as social web outlets. Publicized 20% food discount at the restaurants for all active military and veterans, and secured gift certificates for a USO golf tournament and for events sponsored by the National Guard. 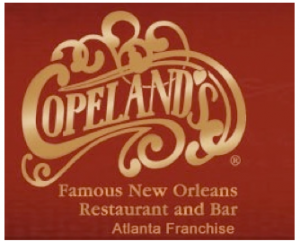 Publicized Copeland’s Sunday jazz brunch and special holiday menus. Manage hyperlocal target marketing and conduct reputation management on customer review social media sites, such as Yelp, Trip Advisor and Urban Spoon and wrote articles for the restaurant’s blog. Aligned the franchise with key executives and programs sponsored by the Cobb Chamber of Commerce, the Cobb Energy Performing Arts Centre and the Cobb Galleria Centre. Extensive outreach to non-profit organizations across metro-Atlanta led to a new image as a corporate good citizen and helped drive in new customers for their holiday events and jazz brunch. The social media also has helped drive in new customers through the use of review management and check-in offers. And, because of their extensive involvement in community actitivies, we've been able to garner them publicity in multiple media outlets, including the Northside, Sandy Springs. Kennesaw, Smyrna and Vinings Neighbor newspapers, the Smyrna-Vinings Patch, Atlanta Journal Constitution and Atlanta television news stations WXIA 11 Alive, Fox 5 and Channel 46.